As with “Breakfast At Tiffany’s”, “Don’t Speak” is a rarity: an American modern rock hit that managed to duck under Britpop’s Crimplene Curtain and chart here. In the US, it dominated airplay charts for months – no surprise No Doubt’s UK label sensed a hit in waiting. And like “Breakfast”, it’s one side of a break-up conversation – but where Deep Blue Something grasped at the thinnest of straws to keep something alive, Gwen Stefani knows it’s over, and seems just to want to dodge the final blow. There’s another parallel, too: “The Winner Takes It All”, also an intra-band break up record. That’s a magnificent song, but also pure theatre: a man’s fantasy of how his ex-wife might be feeling. “Don’t Speak” – written by the jilted member – goes to messier places. No Doubt apparently tried a few arrangements for “Don’t Speak” – from the raw to the bouncy – before settling on this slightly skewed take on the power ballad, building its drama from the now-established quiet-loud dynamics of alt-rock. Bits of other ideas poke through – ominous movie theme chords on the “it’s all ending” middle eight ratchet up the tension; the Spanish guitar solo immediately dissipates it. It’s all filling in gaps in the song’s odd, potent structure – each twee sing-song verse gets cut off sooner and sooner before the chorus, the song shutting itself up repeatedly as the situation spirals downwards into pain. The final verse – “I can see us dying / are we?” – is pure fake-out, jumping straight back into the chorus, but this time punching through it into the brutal coda that’s the best thing about “Don’t Speak”, Stefani keening the title and eventually fading into a grieving, desperate lullaby. In between, she turns the record on its head. “I know you’re good, I know you’re good, I know you’re real good”, she sings – angry for the first time in the song, snarling the word “good” with deserved contempt for every man who ever reasoned his way through a break-up, picking words not to spare his lover, but to sustain himself as the nice guy. She was never trying to silence him to keep him – that boat has sailed, and they both know it. She just wanted to still respect him afterwards. This is perfectly decent but doesn’t stoke my imagination much, despite the subtleties of the production and what not. 7 seems fair – it’s definitely better than average – but it’s not something that I would call a personal all time favourite. No Doubt always struck me as a bit perfunctory. Good at what they did and undeniably professional but there were other bands coming out of the USA at this time that were more to my tastes – Green Day for instance (bunnied?). What You Waiting For? Now there’s a classic. Hollaback Girl was bloody irritating though. Best thing Gwen Stefani has ever been involved in might well be The Aviator, where she played Jean Harlow. She certainly had the look for it, at the very least. #29 Sash’s misfortune was one of lousy timing – in an era of one week wonders he was stuck behind a big selling number one each time. Curiously I’ve just noticed that only once (Mysterious Times) did he lose out to a new release, on all the other occasions he entered at number two behind an incumbent number one. Since by the time those other chart toppers roll around we might have much else to discuss I’ll name my favourite of his as Ecuador – partly because there was a stunningly attractive audience member directly behind him when he performed on TOTP. I didn’t realise Creedence Clearwater Revival had that many runners up in America; I thought they were one hit wonders as a band – and I’ve seen John Fogerty live too. There was a lot of promotion of ‘Just A Girl’ in November 1996 even getting a TV advert so when that flopped they looked like another ‘here today gone tomorrow’ act. That was until this broke through. A sort of US college rock ‘Nothing Compares 2 U’ which was really the bands piece de resistance. Epic in scope and a great performance from Gwen Stefani. The rest of No Doubt’s work wouldn’t be my cup of tea though. Never liked the Hey Baby’s or It’s my Life cover for example. Stefani’s clown face sad face imagery could get a bit annoying. Never that keen on the solo career either and as some songs have been adopted as sporting anthems of sort they are still played often. I’m sick of hearing ‘the Sweet Escape’ especially. Gwen Stefani is the New Pop bedroom worshipper abroad who’s still flicking her nail clippings at her posters; as a solo performer she continues to try just a little too hard to make it a Toni Basil and Thompson Twins sort of 1982, but in her early No Doubt days at the very least she endeavoured to inject her real self into the music which she made or in which she participated; the angry undertow of “Just A Girl” is justified and more than valid. 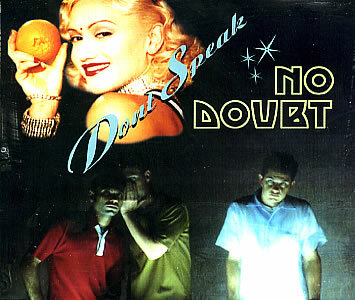 “Don’t Speak” seemed to some at the time a rather too abrupt transition from No Doubt’s standard ska-punkism, a last resort at a board-crossing hit record, but its cloistered doubt cut serenely through the airwaves of the time and has endured rather well. As with 1997’s other great break-up song, Sleater-Kinney’s “One More Hour,” “Don’t Speak” is about trying with all one’s might (“Our memories/They can be inviting/But some are altogether/Mighty frightening”) to stall for time, to talk the Other out of ending the relationship; her bemused “I really feel/That I’m losing my best friend” scarcely conceals the underlying morbid dread. Essentially she does not want to hear that they are “dying” but unlike “One More Hour,” with Corin Tucker’s increasingly hysterical screams which are answered by Carrie Brownstein’s semi-sympathetic, semi-sarcastic chants of “I know, I know,” Stefani maintains her countenance throughout and we do not hear from the Other side at all. The music is a slower, bleaker expanse of the watery Latinate sunshine of “La Isla Bonita” (indeed “Don’t Speak” could function as a useful understudy of a record by Madonna, who at this stage was occupied trying to kill Eva Peron all over again) with a slight increase in intensity at the middle eight followed by a winsome electrified Spanish guitar instrumental motif which dies out in specks of mournful trumpet synth before Stefani returns to the square one of the now hazy concept of “you and me.” In addition I must emphasise the crucial role of Melissa Hasin’s ‘cello in thickening the arrangement, as well as acknowledging other parallel precedessors, notably Jane Scarpantoni’s contributions to Nirvana’s MTV Unplugged In New York and Bob Mould’s Workbook. As the final choruses slowly dim into limbo, Stefani makes her last efforts to stop him from telling her the reasons, if reasons there be, to prevent him from saying anything; she gives him one last taste of what he’s likely to be missing – “I know you’re good, I know you’re real good” – before she lies down with him once again, whispering with suicidal sweetness “Push, push, darling,” entreating him, decreasing the vowels into sighs; perhaps she has averted disaster for now, but how many times will she have to do this again before mechanical repetition kills the last smouldering remnants of wonder? She won’t tell herself, because it hurts. I’m always in two minds about ‘Don’t Speak’. It’s a far better song than a lot of others in the same vein, and yet it’s by no means the best No Doubt single. There was a real freshness about them around this time and like Blondie they turned out to be a band who could try on different styles but still sound like themselves. Having a charismatic lead singer is one way of retaining that identity. #34. I’d always heard that as “hush, hush, darling” in the run out. #17 Yes! Top of the Pops changed producers during this record’s run at number one, Ric Blaxill being replaced by Mark Wells, and after it fell from the top spot the performance was shown again on three further occasions while it continued to hang around in the top five. You could cite this, perhaps, as a change in the perception of what made a “proper hit” – rather one that climbed slowly building momentum, because all records now inevitably entered as high as they were ever going to get, the big hits were the ones that dropped down the charts slower than all the others. And from that moment Top of the Pops would regularly feature records going down the charts and the previous week’s number one. I remember turning my nose up at the guitarist’s Madness T-shirt in the video because I thought it looked ridiculous to wear merchandise from another band in your own band’s video. I also remember visiting a branch of The Gadget Shop which managed to clear out all the customers by playing Oi To The World at great volume. #34 I’ve often seen you refer to “New pop”, but I’ve never seen the term anywhere else. What does it mean? Forgive my ignorance. On the other side of the coin, Ex-Girlfriend (Which grazed the UK top 30) is one of her angriest and most bitter songs. They deservedly had their best commercial run with the poptastic ‘Rock Steady’, but it did feel a little bit neutered compared to Saturn, and Stefani’s solo career has generally felt equally lightweight. I marvel now at the fact that I never heard this at the time – or if I did, it never registered. “Just a Girl” was all over the radio station I used to listen to, Tragic Kingdom was an inescapable presence on record store racks, and “Don’t Speak” was number one in Australia for eight weeks from 9 February 1997 – eight weeks – and yet I had no memory of it before watching the video last week. The recent LL Cool J track was eminently forgettable and didn’t chart well at home, so I could justify my ignorance there, but neither is true here. So with a fresh ear, untainted by overexposure: I like it. It’s full of interesting flourishes, owes an obvious debt to Madonna, and sounds like it deserves to be number one, rather than being a fluke of one. 7. This track always reminds me of cable-tv. Just before it came out, I moved to London’s Turnpike Lane, where, being on the side of the hill where the transmitter was, meant rubbish TV reception and everywhere, including our cheap rented house, had cable. For the first time, this gave me access to a proper music channel, although nothing so high-end as MTV. Instead we got The Box, a channel where you called a premium rate line to request a specific video, would see your selection number flash by on-screen with a cheery “Thanks!” and then wait. And wait and wait. And in the hour-or-so we waited for Placebo’s Nancy Boy or lost Euro-classic Hondy, we’d see the video for this an awful lot. Obviously compared to the instant gratification of Youtube or Spotify it was all hideously slow and clunky (and gave you a lot of exposure to No Doubt) but looking back it does seem like an early, teetering step to new models of single consumption. 41: Those dial-a-play/jukebox channels have a hand in some upcoming bunnies too. I was wracking my brains to think whether this might have been the first get to #1 using what I came to think of as “the Kerrang TV effect” – I was going to raise it as as issue around the time of the bunny that got big with Smash. Seems like you have a better memory than me though. There are a couple of other US rock bunnies that seemed to garner an awful lot of support on Kerrang TV, more than I remember them getting on Radio 1, sufficient that they managed to get to #1 off the back of that constituency. Re 38: In very broad outline, New Pop was the move in the early ’80s by brainy British people who had involved in punk/post-punk to start making music that was deliberately suited to the charts – if you look the Popular entries for songs by Adam And The Ants and Human League, you can pick up the trail. If you want to immerse yourself fearlessly, try Punctum’s look at ABC’s The Lexicon Of Love. And New Pop had a chief ideologue in then-NME writer Paul Morley. Ah, thanks – that makes sense. I don’t know whether Gwen would have been the right age or place for all that, though. Weren’t they all Madness fans? Re44: Right age? She certainly is – she’s almost exactly a year older than me so I think I can gauge that reasonably well. Right place? Not to read Morley and Penman on the New Pop (and maybe a little young for that, too), but you could certainly hear it – and, more so, watch it on MTV. ‘Weren’t they all Madness fans?’ That seems awfully reductive – who says you couldn’t like Madness and the Human League? (OK, possibly some Madness fans at the time, but most people can’t actually tame their ears like that). #21 – belatedly replying to Alfred’s comment about how Stefani is an “inexplicable pop star” – I think the video explains her very well. If one of the points of pop – probably the point of pop that’s been most sustained over the 62-year span of Popular – is to repeatedly show its audience what Greil Marcus called “a new way of being in the world”, Stefani fits the bill: the combination of skater athleticism and pin-up glamour is new, and she makes it make instant sense. I didn’t care much about her either way at this point – in the early 00s I loved her though, her restlessness and enthusiasm and willingness to try apparently stupid things. Dancehall, call-and-response, dadrock (one of her best songs – “Early Winter” – was written by Keane of all people), YODELLING for gods sake – it didn’t always work but she was an avatar of early-00s poptimism, the pop star whose actual output seemed to respond best to the kid-in-a-sweetshop listening glut P2P networks had unlocked. I wish I was covering her again. Well said Tom, 46. For further evidence of just how much Stefani had cracked it by the mid ’00s consider how closely Gaga emulated Stefani on some of the best album tracks on The Fame, e.g., Summer Boy. Publically admitting her second album largely consisted of songs that were left over from sessions for her first never struck me as brilliant marketing from Mme Stefani. I appreciate her willingness to try new things, but the more self-consciously ‘wacky’ elements of her solo career could be really grating. Wind It Up must surely be one of the very worst pop hits by a major recording artist of the 00s. Agree that Early Winter was great though. Wonderful Life was the other take-home from the largely awful Sweet Escape album for me. I can understand why the title track was huge, but like most Akon stuff it makes my toes curl. Definitely. It says something about Gwen’s star quality that her working with Eve, Doctor Dre, the Neptunes, Akon and the rest never seemed forced or incongruous. And as diverse as they were, the tracks always felt like Gwen Stefani tracks. She could walk into any room, anywhere in the world, and instantly be the coolest person in it. #47 Nevermind album tracks, the moment I got Gaga was the “Paparazzi” single/video and the realisation of how much she shared with Gwen’s whole approach (of course, they coincidentally share the name Stefani too). Annoying pedant point – her two solo albums were 2004 and 2006, so not really early ’00s! I guess if you include Rock Steady it works more. Dear God, how my 00s pop listening would have been improved if Pop’s Last Great Imperialist had been as interesting as Gaga. The Harajuku Girls are well over that line, in my view (and that of people far more qualified to have a view than me). What do the Girls themselves have to say about it? I imagine they have shockingly failed to denounce the best thing that happened to their career? Blimey, that had completely passed me by – I caught the reference in What You Waiting For? but had no idea it was A Thing across that whole record (another artefact of the P2P era – there are loads of records where I couldn’t tell you anything about the looks/images/videos or even what the sleeves look like). That is very dodgy – and her defense seems to have been along time-honoured “keep digging” lines. I still think I wouldn’t call it “imperialist” in the definition I was groping towards on the U2 thread, but that definition needs work and probably a less loaded word for a smaller idea. In the meantime I’d be happy with the perfectly functional word “racist” for the Harajuku incident. The politics of backing dancers is a massive can of worms in general of course and one I’ll have to do some serious thinking about before the 2013 entries (having failed to do serious enough thinking about it on the 1990 ones). I was at a wedding in Prague a couple of weeks ago when the DJ inexplicably put this on as a slow dance. It’s one of the most perverse DJ choices I’ve ever heard, not jsut because of the theme but because it keeps changing tempo and all the dancers hilariously tried to keep up.